If you are heading to Epcot, you have more than enough food options. There are so many option especially when looking to dine at the World Showcase. The showcase consists of many different countries along with several restaurants. There is always something for everyone! What I like about the showcase is that you can try authentic food from other countries. 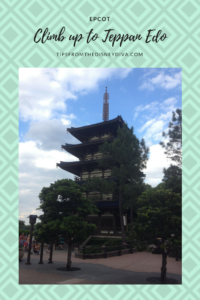 On one of our trips to Epcot we decided to give Japan a try! 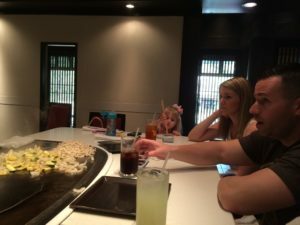 Teppan Edo was our pick this time! Let me tell you, it was a great choice! I always think of Hibachi as a fun dining experience! We have gone to one a few times near our home and always enjoyed ourselves! I always thought my kids would get a kick out of the little show while they are eating. So, if we do it at home, why not try Disney? Once you head over the where the restaurant is located, there is a check in spot. Upon arrival you are given a pager. The restaurant is located on an upper floor. Once paged, you head up the large staircase into the restaurant. There is a large seating area where you wait to be seated at your table. You head down a long hallway which consists of many different dining rooms. This is a nice feature because you are not in a large loud room with many people. It is set up a little more “quaint”. What I also liked once we were seated, was that there were about 8 seats per table. This is nice because if you are with a larger party you can sit together but you also are not crammed at one table with people you may not know. This worked great for us because at the time we met friends and we were a party of 7 so we had a table of just us. 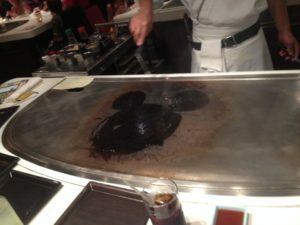 Teppan Edo is in Japan in the World Showcase at Epcot. Whether you are a couple or you have children with you, this is a great dining option. I feel like kids of any age will be slightly entertained while dining here. How can you not find a cook who is cooking in front of you and thawing food around not fun? 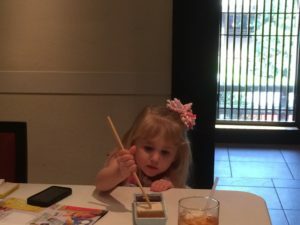 My daughter had never dined at hibachi before, only my husband and I had done it. My daughter was three when we dined here and LOVED dinner! 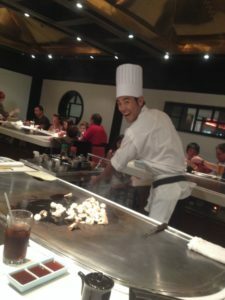 Our cook was funny and was very outgoing. This kept her in her seat and watching, wondering what he would do next. It was fun for everyone, not just the kids! The menu basically follows the normal type hibachi menu. The pricing starts around $15-$35 per person. You can choose the typical hibachi combo or choose a la cart options. We did the hibachi dinner option which included your sides of vegetables and noodles. 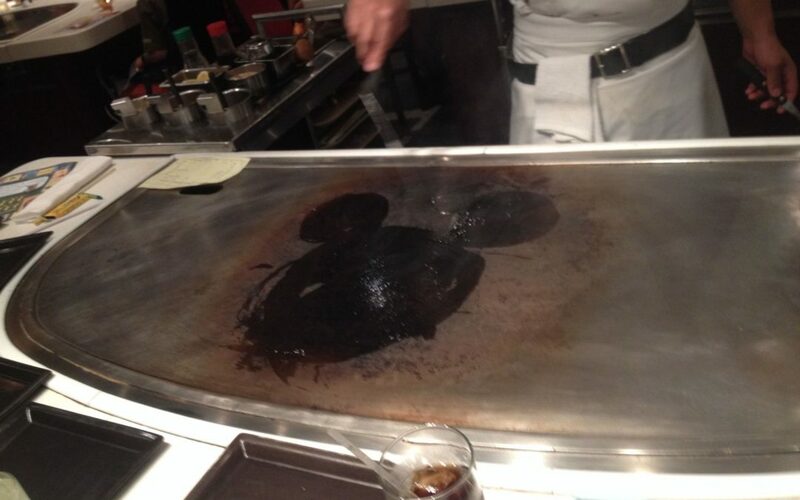 While our food was cooking, for some extra entertainment, “Disney-Style” our cook drew a Mickey head on the grill with oil. I love that slight Disney touch! It is not Disney overload for those you want more of a “normal” dinner, but it is enough of a touch to make you smile! If you would like to have your own Disney experience, contact Patricia at All For Dreams Travel for a free booking quote!